This Apache Junction hotel just outside of Phoenix offers great accommodations and the beautiful scenery of the Superstition Mountains. The Best Western Apache Junction Inn is conveniently located with easy access to the scenic Apache Trail. Hotel guests can explore the Superstition Mountain Museum, take a cruise on the Dolly Steamboat at Canyon Lake or explore the Goldfield Ghost Town. Visitors will appreciate the variety of nearby shopping options minutes away at Superstition Springs Mall. Varied dining options are also within a mile of this Apache Junction hotel including Scuttlebutts for pizza or Los Gringos Locos for Mexican cuisine. 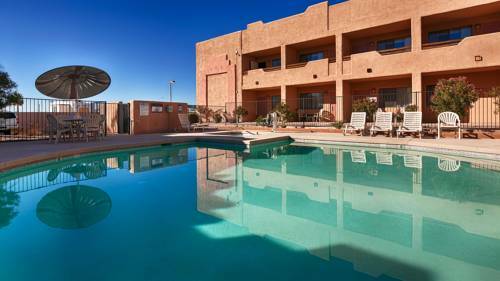 Guests of the Best Western Apache Junction Inn will receive a daily complimentary full hot breakfast, free newspaper and a beautifully designed outdoor swimming pool with whirlpool. Business travelers will value the free high-speed Internet provided along with access to fax and photocopy machines. The stunning views of the Superstitions and the unique Southwest design make this a great lodging choice for exploring Arizona. Make a reservation today at the Best Western Apache Junction Inn! Enjoy your stay. From: The north. Take Interstate 17 South, then take Interstate 10 East, then take US Highway 60 East. When you reach Apache Junction, take Exit 195, Ironwood Drive. Go north about two miles to Apache Trail, turn east onto Apache Trail. Best Western Apache Junction Inn is located on the south side of Apache Trail, a quarter of a mile east of Ironwood Drive. From: The south. Take Interstate 10 West, then take US Highway 60 East. When you reach Apache Junction, take Exit 195, Ironwood Drive. Go north about two miles to Apache Trail, turn east onto Apache Trail. Best Western Apache Junction Inn is located on the south side of Apache Trail, a quarter of a mile east of Ironwood Drive. From: The east. Take US Highway 60 West. When you reach Apache Junction, take Exit 195, Ironwood Drive. Go north about two miles to Apache Trail, turn east onto Apache Trail. Best Western Apache Junction Inn is located on the south side of Apache Trail, a quarter of a mile east of Ironwood Drive. From: The west. Adjacent to Sonic, fast food, American, open for: breakfast, lunch, dinner, 6:00 a.m. to 12:00 a.m.
3.5 mile(s) from Superstition Mountain/Los, The Superstition Mountains offer an incredible outdoors experience year round. 1 mile(s) from Scenic Apache Trail, A scenic trail that loops from Apache Junction to Globe and returns to Apache Junction. It traverses three lakes that are great recreation spots and goes through many mountains that offer numerous hiking trails. ~23 miles from Apache Junction. ~29 miles from Apache Junction. ~30 miles from Apache Junction. A doll for a giant. The 39-ft. tall version of a traditional Native American doll stands at the entrance to the Tonto Hills residential development. ~35 miles from Apache Junction.